Acer is announcing a range of new netbooks. 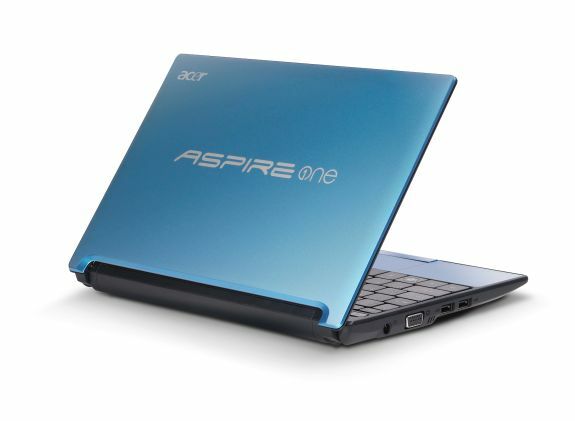 The first is the Acer Aspire One AOD255 that uses the dual-core Intel Atom N550 processor for the first time. Details of the Atom N550 and previews of some of the first netbooks to use it are available here. The new processor has the same GMA 3150 IGP and is supported by 1GB DDR3 RAM, which really should be 2GB in our opinion, but that explains why it comes with Windows 7 Starter Edition. Storage is provided by a 250GB HDD. The new model features a 10.1” CrystalBrite LED-backlit display and boasts up to 8 hours of battery life in a 1” think chassis weighing just over 2.5lbs. The chassis features a "93% size" keyboard and an integrated 1.3MP webcam with digital microphone. Wireless 802.11b/g/n and wired Ethernet are also included. It will be available in red, black, brown, or aquamarine (blue), with a cheaper single-core N450 variant also available. Also launched are the new Acer Aspire One AO521 and AO721 models that are more multimedia orientated, pairing AMD Athlon II Neo K125 processors with ATI Radeon HD 4225 graphics sharing 384MB of system memory. These netbooks gain an HDMI port, along with wireless 802.11b/g/n, wired Ethernet and an integrated webcam with digital microphone. The AO521 features a 10.1” CrystalBrite LED-backlit display in a chassis that is an inch thick and weighs 2.75lbs. It comes with 1GB DDR3 RAM and a 160GB HDD. It runs Windows 7 Starter and delivers up to 6 hours battery life. All the new netbooks feature trackpads with support for gestures such as scrolling and pinch to zoom. They will all be available later this month with the Intel Atom AOD255 starting at $270 for a single-core N450 model, and $330 for a dual-core N550 model. The AO521 will cost $350 and the better spec'd AO721 will be a steep $430. While nothing out of the ordinary, it's a shame to see nothing new with the N550 processor model. A 1366x768 resolution LCD would have been a nice upgrade, and the continued lack of RAM is always a sore spot with Atom netbooks. The only tempting model spec-wise is the AO721, but it's on the wrong side of the $400 barrier.